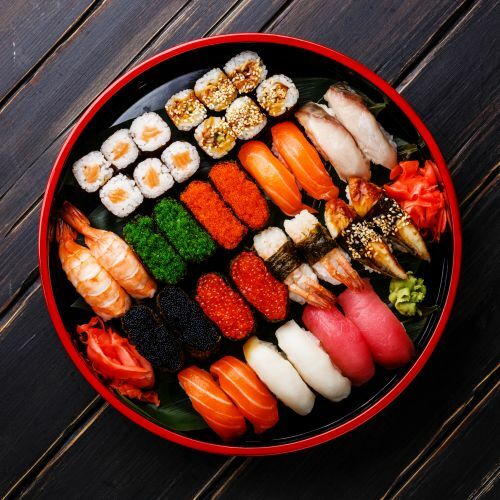 Menulog delivers for Oya Japanese Restaurant so you'll be able to track your courier on a map. Agedashi tofu with green salad and special Japanese sauce. Mixed seafood and vegetable tempura. Combination sushi of tuna, salmon, prawn, scallop, king fish, octopus and surf clam. Mixed sushi nigiri and gunkan. Mixed Sashimi with tuna, salmon, king fish, surf clam and prawn. Traditional Japanese curry and salad served on rice. Japanese rice bowl dish with teriyaki beef, crispy chicken or oyakodon. Ebi katsu don topped with panko-breaded prawn and scramble egg. It’s simmered in a special Japanese sauce base. Premium Japanese unagi with salad and cooked eggs, topped with sweet traditional sauce. Mixed vegetable salad with crab meat, salmon and prawn. 7 x Mixed Nigiris, 3 x Salmon Sashimi and 3 x Uramaki. 8 x Nigiris. Salmon, tuna, king fish and prawn. Mixed Sashimi, assorted nigiri and salad. Salmon, king fish and tuna sashimi. Grilled eel with teriyaki sauce. Grilled salmon with mayonnaise and teriyaki sauce. Grilled scallop with teriyaki sauce and mayonnaise.